center, next to the castle. 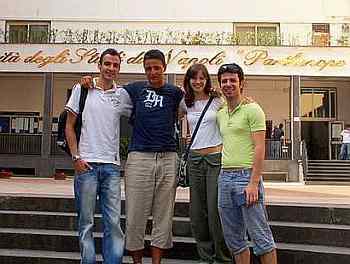 Still referred to by students simply as the “Navale,” the Università degli studi di Napoli “Parthenope” is now one of the fully accredited universities in Naples. 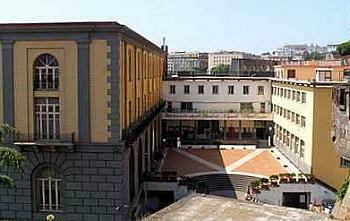 It was founded in 1920 as the Regio Istituto Superiore Navale, the Royal Naval Technical Institute, and was further upgraded in the 1930s to the Istituto Universitario Navale. In spite of the name (and the misconceptions of more than a few!) the institution is not a military academy and is certainly not the Italian Naval Academy, (which turns out naval officers and is located in the city of Livorno). The Navale in Naples was founded as an institute of “encouragement”—that is, for the promotion of studies having to do with maritime economy. With the recent expansion and completion of facilities, and final accreditation as a full university (and not just an “institute”) the current student population of some 15,000 may graduate with degrees in economy, nautical sciences, international business, law, and environmental sciences, among others. 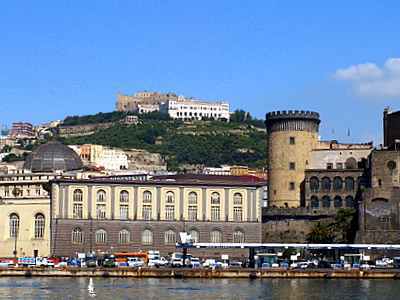 The main premises are directly opposite the passenger port of Naples, next to the Maschio Angioino castle, in what used to be the Royal Foundry and ancient “arsenale” (shipyards) of the Kingdom of the Two Sicilies. Additionally, the “Parthenope” has acquired classroom spaces on the Posillipo coast (the Villa Doria d’Angri) and the former church of San Giorgio dei Genovesi in the center of town. Additional space is being completed at the new civic center, the Centro Direzionale. I promised to put these kids in pictures.